As we exit turn two of the 2012 NASCAR season, we visit one of the most physically and mechanically demanding tracks on the entire schedule. Ever since it's opening in 1968, Dover International Speedway has been known as a track that eats away tires, burns up engines, and is torment on drivers, not to mention the large amount of torn-up sheet metal. Notorious for it's large crashes (remember Joey Logano flipping back a few years ago? ), there is a reason that this track is known as "the Monster Mile". And it doesn't end at wrecks. DIS a superspeedway that thinks it's a short track, a race with occasional bump-and-runs and donuts on the sides of cars. Combine that, the G-forces of 400 laps at this tough little oval, with the headaches of frequent fuel-mileage finishes and impatient drivers, and you have a recipe for flaring tempers and regretful reactions. Along with Phoenix and Loudon, Dover is one of only 3 one-mile tracks on the entire Cup circuit. This makes it difficult for crew chiefs and engineers, who have to create cars and setups for a venue that's not quite an intermediate track, but too large for a short track. 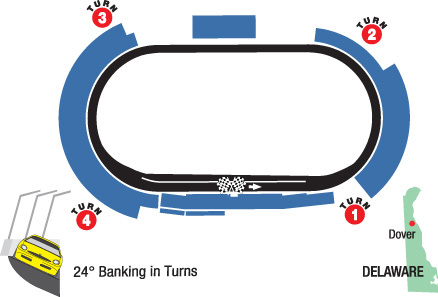 With 24 degrees of banking in the turns and 9 degrees on both straightaways, DIS is highly banked and features almost 3 full lanes of racing. This means that plenty of passing will occur, most notably coming into and out of the corners. Certain drivers and cars will race better on different lines, some high and some low, while others remain in the middle. A winning car can run all three lanes, which is much easier said than done at Dover International Speedway. Pit road speed limit is 35mph, but the pace car will lead the field at 45mph on Sunday. Patience is the key for winning here, as 400 laps is a very long time to gain positions and still learn what your car has. Drivers will often try to get up front and lead laps all day; but engines, and even more often, brakes, can and will fail. Most recently, it's what cost A.J. Allmendinger his first career win here last season, and it's what will for sure ruin many more days in the future. It makes this track very similar to Martinsville in the aspect that drivers have to conserve their equipment. This concrete oval also has more than a few bumps in both ends of the racetrack. "As high-banking and as fast as Dover is, concrete was the only thing could really put down that would survive. Once the concrete ages a couple of years, it gets joints in it, and it becomes kind of like a wooden deck. It gets bumps in it and you just hop all the way around the racetrack. That’s just the way it goes,” says Dale Earnhardt Jr. Without doubt, this is one of the most difficult tracks on the NASCAR circuit. Most drivers are either very good or very bad at Dover. Here are my suggestions for your Fantasy teams this week, starting out with Yahoo! Fantasy Racing and closing with NASCAR Fantasy Live. More than a few drivers struggle figuring out this "Monster", but you can rest assured that there are also a group of drivers who run phenomenally here. For my A team on Yahoo!, I am selecting Jimmie Johnson and Kyle Busch. In the last six races JJ has three wins and has led 157 laps or more every race (1,349 total laps in last six). Some more impressive stats of his in this stretch are his 2.3 average running position and 5.0 average finish. Johnson ranks as the best in the series in all of those statistical categories. He is my pick to win on Sunday afternoon. Kyle Busch has finished 1st, 6th, 4th and 6th in his past 4 races here. In this select group of races Busch has averaged the most points per race (41) and has the second best average running position (6th). Dover has always been a good track for Busch, because in his rookie season he finished 2nd in both races. I think he'll be a contender for the pole, and he should be good for a top 5 and lots of laps led. Other good picks for Group A include Matt Kenseth and Carl Edwards. For my B team, I have Greg Biffle, Martin Truex Jr., Jeff Burton, and A.J. Allmendinger. The Biff is a two-time winner at Dover and since 2005 he has the fourth best average finish in the series (9.0). Before his current three race drought at Dover he had a twelve race streak where he finished in the top thirteen every race (9 top tens). I think that he will definitely be good for a top 5 and maybe even a win. As for Truex, he is a high risk driver but may have high reward. I feel that he is worth that risk however, as his spring average finish is 11.6 over his career. On similar tracks this season he’s finished 3rd (Bristol) and 5th (Darlington). If you’re looking for a pole contender consider Truex. He’s won two out of the last four poles at Dover. A top 10 is likely, but he could be as high up as the top 5. With Jeff Burton, the last three years his spring finish has been the same as his fall finish. In 2011 he finished 11th in both races, in 2010 he finished 2nd in both races, in 2009 he finished 16th in both races and in 2008 he spiced it up a little bit by finishing in 8th and 9th. He's very consistent, and I think he'll be good for a top 15 or even a top 10. As I mentioned before, A.J. Allmendinger had a winning day going on here last spring (he led 166 laps), but a engine issue put him behind the wall. In his 10 career starts here, he has three top-10 finishes and has led 152 laps. The Dinger also has qualified on the front row for two of the past three races at Dover, so he should put up some qualifying points. Barring any mechanical failures, he should contend for a top 5. Other good picks for Group B include Kasey Kahne, Clint Bowyer, Ryan Newman, and Kurt Busch. The C group on Yahoo! Fantasy Racing is a fairly small group this week. Often, drivers such as Trevor Bayne, Michael Waltrip, Brian Vickers and Danica Patrick have enter the race and provide fantasy players another option for their team. That is not the case this week. So I will use one of my precious starts for Aric Almirola, with by backup being Casey Mears. Almirola is by far the best driver in this last group every week, but you have to be very careful when using him, and I like to play him when none of the 4 above drivers aren't entered. Unfortunately, he's never started a race here at Dover, but I feel that by the time the week is over, he should be good for a top 25 finish. Mears will most likely be on my bench, but I may switch him to starter if he runs good in practice. He has four consecutive top 25 finishes headed into Dover, and in his 18 career starts at Dover, Mears has three top-10 finishes. I expect him to finish near that and keep his streak going this week. For NASCAR.com's Fantasy Live, my lineup, as usual, is virtually the same as my Yahoo! team, with only a few small changes. Personally, I had a tough time choosing this week's rosters, mostly because of the budget. The game limits you to $100 in Fantasy dollars, which you buy 5 drivers with. The problem is that without drivers like Bayne, Patrick, or other part-time drivers in the field, I was stuck with a tight budget. My lineup includes Matt Kenseth ($27.00), Greg Biffle ($26.75), Jeff Burton ($21.00), Kurt Busch ($17.00), and David Reutimann ($8.00). This totaled $99.75. To be perfectly honest, I am doubting my roster for Dover, as I had no room to put Jimmie Johnson, A.J. Allmendinger, Martin Truex Jr., and many other front-runners on my team. I'm hoping that the Roush duo of Biffle and Kenseth will earn me most of my points. The NASCAR Sprint Cup Series has my favorite type of schedule for this weekend, with two practices on Friday, followed by quals on Saturday and the race Sunday. The two practices will be aired live on Speed Channel, the first at 11:00am Friday, followed by the second at 2:45pm. Speed also has qualifying, which is at noon Saturday. FOX's broadcast (their last of the 2012 season) of the Fedex 400 Benefiting Autism Speaks (400 laps/400 miles) begins at 12:30pm Sunday, with the green flag scheduled to drop at approximately 1:15pm. All times are ET. One of my favorite races.